For two years, Manju Bond tried desperately to rescue camels from being slaughtered during the Bakrid festival, but failed. On the third year, 2012, as the time of Bakrid drew near, he was more determined than ever to save at least one camel from a miserable fate. During the Moslem Bakrid Festival, there is a tradition of slaughtering animals. Unlike cows, sheep, and goats, camels are slaughtered only during Bakrid. The town of Hospet in southern India, where Manju Bond lives, serves as a gateway to the UNESCO World Heritage site of Hampi, a place of ancient temples in a setting of giant, otherworldly boulders. The Bakrid festival follows the lunar calendar, and last year, it was held in October as usual. Ahead of time, Manju set about gathering support from his animal welfare friends and searching for places where a camel might be concealed, before being slaughtered. Camels are brought to the area just a couple of weeks before Bakrid; kept in hiding, given feed and water, and killed the night before the festival. Usually, they slaughter the camel at midnight when most people are asleep. Finding the place where a camel was hidden was going to require getting people to talk. With a few drinks and a congenial atmosphere, this might be accomplished. He offered drinks to a few likely-looking people, and the more they drank, the more they talked. He learned that around ten wealthy people had gotten together to purchase a camel from a far-away city. They had transported the camel and had kept him hidden in an isolated garbage area. Just hours before the camel was to be slaughtered, Manju now had all the information he needed. Armed with knowledge of the location and other details, he was able to work out a rescue plan. As soon as he knew that the camel would be slaughtered at midnight, Manju went looking for the camel and found him, all decorated for the festival, tethered inside a fenced area. Manju was moved to tears seeing the camel who was about to be slaughtered. At least 500 people were looking forward to having the camel for dinner the next night. He ran back to notify the animal people he knew, only to hear that, fearing retaliation and violence, they weren’t willing to join him in his efforts to free the camel. Finally, he tracked down the senior police officer in the area, and pleaded with him to rescue the camel — while some of his friends got on the phone to the police superintendant, urgently calling for police support. 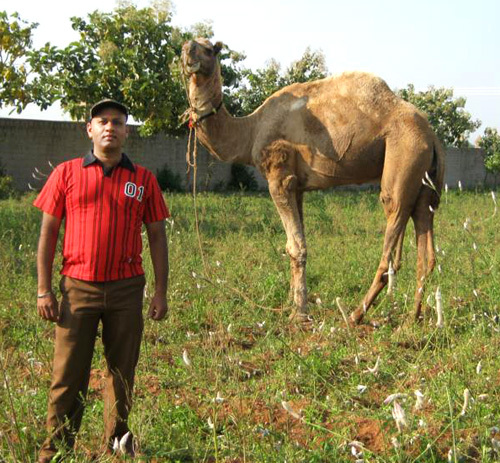 Manju took the police to the site where the defenseless camel was tethered. They freed him and led him away. Transported to the police station, the rescued camel spent the night there in safety. Now the camel has a new life at a goshala (a cow sanctuary), where he will be out of danger and cared for for the rest of his life. Manju Bond, with single-minded focus, has so far rescued from slaughter and found sanctuary for eleven cows, two buffaloes, one other camel in addition to this one, and one pig. He’s also rescued 25 homeless cats. All saved by the efforts of one person, with bravery and determination. To visit Manju Bond’s Facebook page, click here. This is an excerpt from ESAF’s report on the workshop. 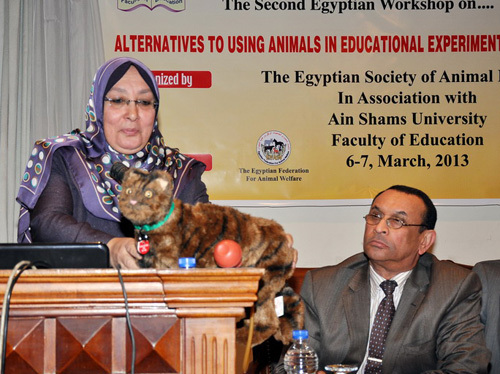 The Second Egyptian Seminar on Alternatives to Animal Experiments in Education and Training was organized by ESAF (the Egyptian Society of Animal Friends) in association with the Biological and Geological Departments of the Faculty of Education at Ain Shams University. The workshop brought together teachers, students, researchers, representatives of the General Organization of Veterinary Services, animal activists, campaigning organizations, media, and others to promote and help implement replacement alternatives across Egypt. In a March 11, 2013 article the BBC reported that the EU has banned the sale of all animal-tested cosmetics. The ban was announced on Monday. The 27 countries of the EU, in 2009, banned the testing on animals of cosmetics in their countries. This ban goes further, and prohibits the sale in Europe of cosmetics tested on animals in other countries. Products already being sold will not be affected. All new cosmetic products, however, will not be able to be sold in the EU, if they have been tested on animals anywhere in the world. Groups like BUAV in the UK, the European Coalition to End Animal Experiments (ECEAE), and Humane Society International (HSI), as well as others, have campaigned for many years to bring about this ban. This is a significant step on the path to eliminating all animal testing. It reflects and reinforces the view of many that all animal testing is inhumane and should be stopped. 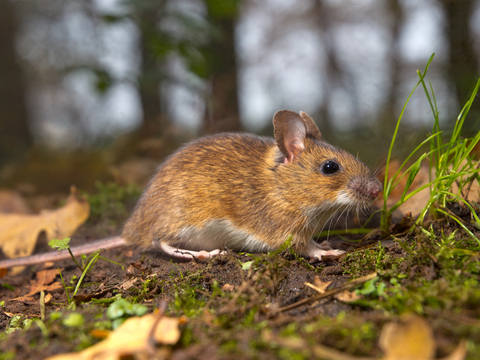 Photo: © Creativenature1 | Dreamstime.com / A mouse in the woods.